WA-based shipbuilder Austal has won a contract worth up to $779 million to build the Independence Class Littoral Combat Ship (LCS 28) for the United States Navy. The 127-metre, Frigate-sized LCS 28 will be the 14th LCS constructed at Austal’s US shipyard in Mobile, Alabama. Austal said the decision represents a continuing vote of confidence in Australia’s design and shipbuilding capability for large naval vessels. While the vessel will be constructed at Austal’s shipyard in Alabama, certain subsystems will be made at Austal’s Henderson facility in WA as part of a continuation of its successful subcontract collaboration with the US. Austal told Defence Connect the Australian-made subsystems will include ride control systems, ride control fins, powerboards and electronic control systems. The company's chief executive David Singleton said the announcement is further proof that Australian industry can compete on the world stage. "While I am obviously happy for Austal, I am also delighted in the vote of confidence this delivers for Australian shipbuilding and design," Singleton said. "We won this award following a direct competition with the Freedom Class LCS, which says much for our cost efficiency on this program. "Austal’s work on the LCS program at our advanced Module Manufacturing Facility (MMF) has seen efficiency gains of 20 per cent with an ambitious target of 35 per cent set for the end of the build cycle. "Should we win the $3 billion Offshore Patrol Vessel contract for the Royal Australian Navy, we intend to introduce many of the advanced manufacturing techniques and efficiency gains perfected in the US into our local operations. "I look forward to working with the Australian government in the future to help them realise their goal of truly sovereign and export capable naval shipbuilding industry." The US Navy is expected to order up to two more LCS vessels in the current US financial year. Austal will be competing against Lockheed Martin for the remaining two vessels, as it did for the first vessel. The company’s LCS delivery schedule remains on track and under the US government's congressional cost cap, having delivered two ships in 2016 and set to deliver two more in 2017. 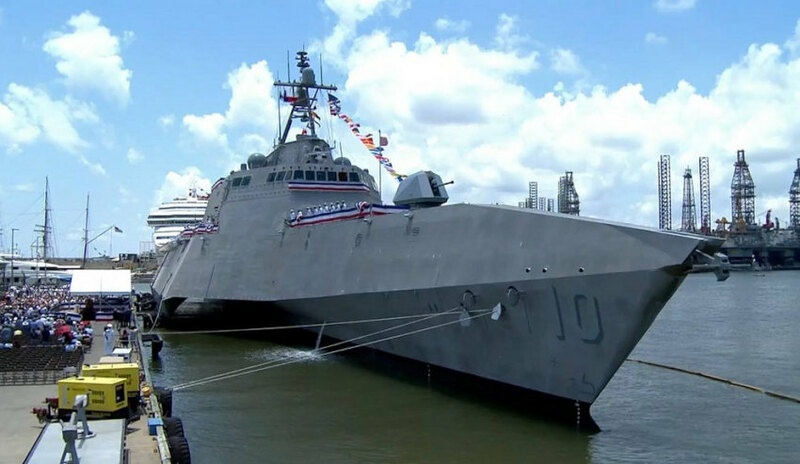 The fifth Austal-built LCS entered the fleet last weekend with the commissioning of the USS Gabrielle Giffords (LCS 10), while an additional seven LCS vessels are under various phases of construction.